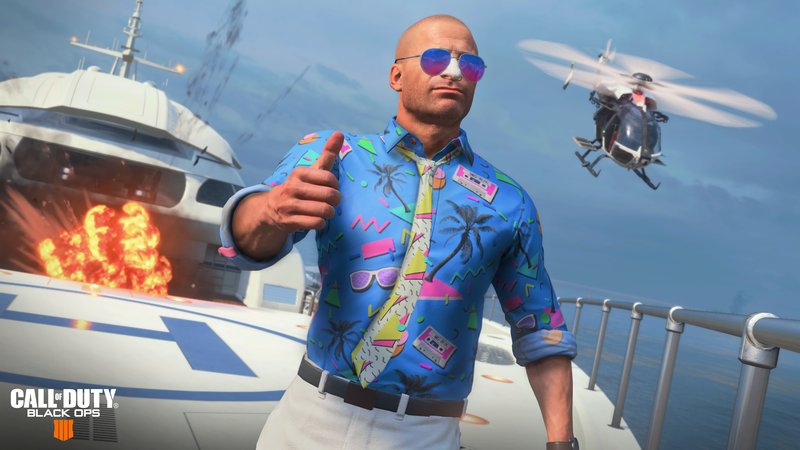 Treyarch released a February 28 update for Black Ops 4 which has finally brought major features that fans have been clamoring for to PC and Xbox One. The game’s new patch comes at the heels of the Playstation 4 update last week, which will now invite for the entire Call of Duty player base to indulge in new additions. The latest update will give the rest of the Call of Duty community access to League Play and the World League Hub which at long last brings competitive ranked Multiplayer to the live servers. • League Play now live on all platforms! In order to climb, players will have to accumulate Ladder Points by winning games. Finish every event as high as possible in your Division Ladder to push through the 20 ranks before Diamond. As for Blackout, players will have to wait until March 1 to hop into the new Hot Pursuit limited-time mode, but will have plenty of content to hold them over until then. The latest LTM will soon be live for PC and Xbox One players. The update also brought the new Ghost Town location to Blackout. For Xbox One and PC players who don’t know, the new point of interest also holds some secrets that can provide extra gunfire if found. With every Black Ops 4 player now able to wet their feet in League Play, the servers should be filled with chaos over the weekend with players attempting to climb the ladder. The World League Hub is now available on all platforms with today’s update on Xbox One and PC, bringing competitive ranked Multiplayer to Black Ops 4 with our all-new League Play event structure! Time to show us what you’re made of. The goal is simple: finish as high as possible in your Division Ladder by the end of each event to advance in rank. Win to earn Ladder Points. Lose, and you lose Ladder Points. There are 20 ranks to advance through on the road to Diamond, so bring your A-game. And if you haven’t already, get all the intel on League Play Divisions, Ladder Points, rank rewards, and more at our World League Rank System blog. Starting with today’s new event, League Play Events will now end at 12AM (midnight) Pacific time. We’re also investigating the implementation of punishments for quitters and intentional teamkillers in League Play matches, as well as stability fixes to ensure fewer crashes and fuller teams going into each match. We’re devoted to making the competitive experience even better with future updates throughout the season, so watch this space and keep climbing those Ladders. In case you missed it, we launched our new Treyarch Developer Update video yesterday featuring the studio’s own David Vonderhaar, Tony Flame, and Jason Blundell to discuss the design philosophy behind Black Ops 4’s newest content and what we’re working on for the future. 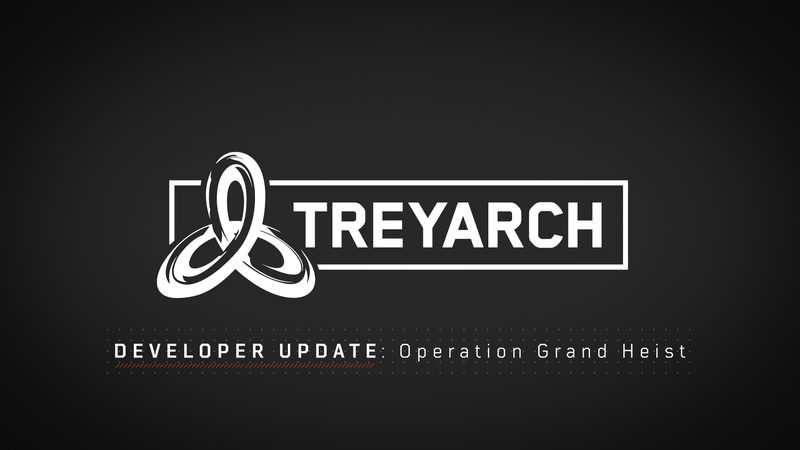 Keep an eye out for the next installment in March, where we’ll be talking more about what’s coming to all three modes in the next big phase of Operation Grand Heist. Let us know what you think in the comments below! Ready for our wildest Blackout mode yet? Hot Pursuit continues this week on PS4 and debuts on Xbox One and PC tomorrow, featuring the new SUV, PBR, and Muscle Car vehicles. What’s so different about Hot Pursuit? Glad you asked. Police vehicle variants and three new vehicles: SUV, PBR, and Muscle Car. Muscle Cars have the ability to spot Supply Stashes and Supply Drops throughout the map, marked with green light beacons. Police vehicles have built-in Sensor Dart functionality when their police sirens are activated, plus the ability to detect enemy-occupied Muscle Cars via red light beacons. Supply Stashes and Supply Drops occur far more frequently than in normal Blackout matches. Similar to Down But Not Out, players respawn with each Collapse as long as one teammate is still alive when the next Collapse occurs. Respawns are disabled at the final Collapse, so plan accordingly! The last team standing wins the game. Pro tip: There’s bound to be more than a few vehicles in the mix in the final circle, so bring an LMG to the fight if you’re looking to come out on top. APB Reactive Camo for the Maddox RFB now properly unwraps. Addressed hitching issues in Create-a-Class during matchmaking. Addressed an issue where a white square would show up in the After Action Report when Gold Camo was unlocked for the Switchblade X9, Rampage, or Cha-Ching. 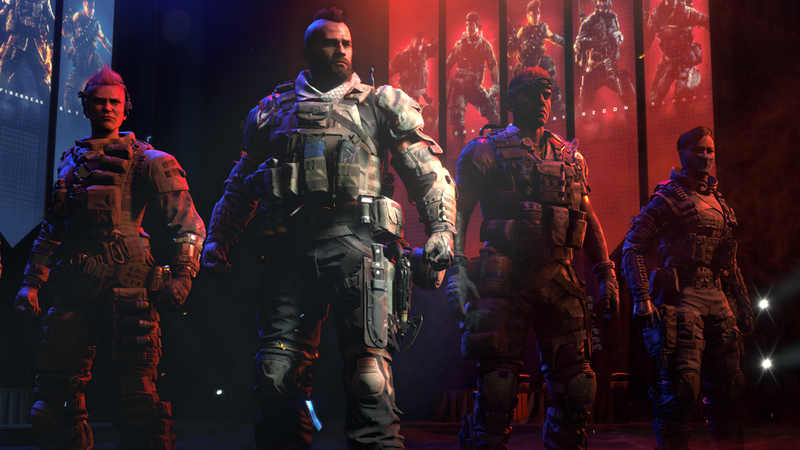 League Play loadouts for first-time players are now reset to fit with the current ruleset. Restricted Fast Lock and Max Load attachments in order to better match the updated CWL ruleset. Addressed a UI error that could occur when selecting League Ladder after completing placement matches. Added “Apply to All” option to Jump Packs personalization menu. Addressed a bug where "Cycle Health" could appear in the HUD when the player had no healing items. Competitive Multiplayer launches today on Xbox One and PC with the World League Hub. Play for rank all week long the week during League Play Events. Compete against opponents in your skill range based on World League Hub’s unique skill-based matchmaking system. Earn Ladder Points as you play. Points go up with wins and down with losses. Finish as high as possible in your Division Ladder at the end of events to advance through 20 competitive ranks. Mystery Box and Armory support added for new Operation Grand Heist weapons, including the Switchblade X9 SMG and Rampage shotgun.